MEF18 Proof of Concept, 29 - 31 Oct - Transformation in Action: Harmonizing Delivery of Intent-Based Networks & Services. PoC Participants: AT&T, Amdocs, Fujitsu Network Communications, and Iometrix. - Automate services with zero-touch delivery and activation across multiple domains. - Enrich the customer experience. - Empower customers by defining policies for their assets and using natural language to set intent. - Develop an assistant to manage customer personas and related interactions. - Create a responsive network that is able to self-adjust and heal to meet customer and application driven requirements. - Provide a homogenous experience across heterogenous networks, blending technologies by creating software-centric network services across multiple domains. The open framework for transformation includes intent, smart devices, an intent engine, orchestration, and an SDN-enabled network. The PoC incorporates MEF work on LSO Cantata, LSO Interlude, LSO Legato, LSO Presto, and LSO Adagio interfaces, the draft SD-WAN services standard, and numerous MEF specifications. The PoC also incorporates ONAP, AT&T's DANOS (disaggregated operating system, which will become open source shortly), and Fujitsu's Warrior open source automation framework for development and deployment of microservices. Save the date for MEF19, 18-22 November 2019, JW Marriott, LA LIVE, Los Angeles. 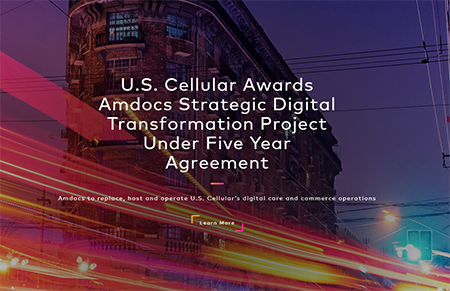 U.S. Cellular selected Amdocs for a turnkey project to transform customer digital care and commerce experiences over its Web and mobile channels. Financial terms were not disclosed. This partnership supports U.S. Cellular’s commitment to deliver world-class digital experiences to its customers, unified across care, commerce and Web and mobile channels, while simplifying operations and reducing costs. Under the 5-year contract, Amdocs will deliver the project in an agile approach, enabling U.S. Cellular to quickly add new capabilities in short iterative cycles. In addition to back-end capabilities, Amdocs will provide front-end portal design, leveraging Amdocs’ customer-centric and design-led thinking best practices. Amdocs will also deliver all associated third-party components, including content management and personalization capabilities from Adobe, as well as ongoing operation and third-party management services, all under a five-year managed services agreement. Vubiquity, an Amdocs company, has been selected by Verizon Managed Services to supplement its expansive collection of on-demand content across existing and future formats, including but not limited to 4K and HDR. Vubiquity will also make this media and entertainment available in a variety of business models, including TV on-demand, rental, PPV and EST. Amdocs, together with Amazon Web Services (AWS), will enable large Philippines telco Globe Telecom, to deliver cloud-based intelligent omnichannel routing and interactions management to quickly adapt to fast-changing consumer demands and truly transform their customer engagements. Separately, Amdocs reported revenue for the third fiscal quarter ended June 30, 2018 of $1.0 billion, up 1.0% or $9.9 million sequentially from the second fiscal quarter of 2018 and up 3.7% as compared to last year’s third fiscal quarter, including a negative impact from foreign currency movements of approximately $9 million. The Company's GAAP net income for the third quarter of fiscal 2018 was $91.5 million, or $0.64 per diluted share, compared to GAAP net income of $119.3 million, or $0.81 per diluted share, in the prior fiscal year’s third quarter. Net income on a non-GAAP basis was $147.5 million, or $1.03 per diluted share, compared to non-GAAP net income of $150.4 million, or $1.02 per diluted share, in the third quarter of fiscal 2017. "We are pleased to report a solid performance in our third fiscal quarter. Revenue exceeded $1 billion for the first time in our history and was in line with the midpoint of our guidance adjusting for currency. On a regional basis, North America showed some early signs of stabilization while Europe and Rest of World delivered solid year-over-year growth that reflected the benefit of recent customer awards and our continued focus on project delivery and execution,” said Eli Gelman, president and chief executive officer of Amdocs Management Limited. Amdocs agreed to acquire Vubiquity, a Los Angeles-based company that provides professional video content management services, for approximately $224 million in cash. Amdocs said Vubiquity's capabilities are of increasing importance to its 350+ communication and media service provider partners. “Vubiquity has successfully been connecting content owners and distributors across many diverse platforms and evolving business models at the core of its support to the media community,” said Vubiquity CEO Darcy Antonellis, who will, upon completion of the deal, be joining Amdocs as head of the Amdocs Media Division. Amdocs reported revenue for its second fiscal quarter ended March 31, 2018 of $992.3 million, up 1.5% or $14.6 million sequentially from the first fiscal quarter of 2018 and up 2.7% as compared to last year’s second fiscal quarter. GAAP net income for the second quarter of fiscal 2018 was $101.7 million, or $0.70 per diluted share, compared to GAAP net income of $112.6 million, or $0.76 per diluted share, in the prior fiscal year’s second quarter. Net income on a non-GAAP basis was $137.4 million, or $0.95 per diluted share. “We are pleased to report solid results for our second fiscal quarter which included double-digit growth in Europe and record revenue in Rest of World. Our operating profitability was stable and we grew our 12-month backlog to another new high. Additionally, we extended our technology leadership with the launch of AmdocsOne at Mobile World Congress and we utilized our cash to close on the acquisitions of Vubiquity, as well as UXP Systems, a leader in User Lifecycle Management solutions,” said Eli Gelman, president and chief executive officer of Amdocs Management Limited. Amdocs announced a contract with Safaricom, a major mobile network operator in Kenya with 29.5 million customers. Safaricom will use revenue assurance technology and expertise from Amdocs to provide more comprehensive and adaptive revenue safeguards for the entire lifecycle of new services across its entire business. DISH Network has selected Amdocs CES 10 for its DISH Business customers, including private offices, hotels and apartments. Under the contract, Amdocs will provide an advanced business and operational support system (BSS/OSS) that integrates all the elements that define the DISH Business experience. This includes delivering the best possible entertainment experience in a wide range of properties with innovative services powered by DISH’s SMARTBOX and EVOLVE set-back box for hotels, and supported by Amdocs CES 10. “With Amdocs CES 10 as our next generation platform for the business sector, we’ll be able to launch new services and further enhance the customer experience,” said John Swieringa, executive vice president of operations at DISH. Amdocs introduced its Network Function Virtualization (NFV) powered by Open Network Automation Platform (ONAP) – a portfolio featuring modular capabilities that accelerate service design, virtualization and operating capabilities on demand. Amdocs said its goal here was to develop network virtualization software that is capacity aware and that wass created using open source technology from ONAP. Amdocs NFV powered by ONAP is the first and most comprehensive software and services offering that leverages open source networking technology, and can be deployed either locally or in the public cloud using modern DevOps adoption techniques. Amdocs is a founding creator of a number of significant modules of ONAP, including Amdocs Service Design and Create to automate service design, and Amdocs Active Inventory for a unified live view of services powered by ONAP. Amdocs is currently working with many early adopter operators in areas such as service design and creation, on-boarding of virtualized service functions, monitoring of active inventory in hybrid networks and the continuous, elastic maintenance of the network itself. This addresses the needs of operators seeking adaptable, scalable, software-driven networks based on cloud and microservices technologies. Altice USA awarded a multi-year agreement to Amdocs for key business and operational support systems. The arrangement will help accelerate the migration to a single Altice USA platform, simplify and modernize technology operations and provide a better experience to Altice USA customers. Financial terms were not disclosed. Altice USA is one of the largest broadband communications and video service operators in the U.S. and the provider of Optimum and Suddenlink-branded internet, TV and phone services. The service provider is working to integrate its Cablevision and Suddenlink legacy business and operating systems and platforms. Amdocs will offer a hybrid solution combining architecture developed by Altice Labs as well as systems from Amdocs, enabling a simpler, more agile and efficient customer-centric system. The companies said the solution enables Altice USA to quickly and flexibly design and launch new innovative offerings and bundles, accelerate order orchestration and fulfillment over its existing fiber infrastructure and next generation fiber network, enable superior omni-channel customer service experience, and future-proof its systems to prepare for next-generation products and services. "As we focus on the future needs of our customers, having a simple, flexible and efficient support system is a vital part of our strategy. By combining the technological strengths of Altice with the capabilities of Amdocs, we are creating a unique infrastructure that will enhance and unify the customer experience we offer in the U.S. as we launch new, innovative products and services for our customers. Amdocs is a valued, long-standing partner for Altice USA and we look forward to working together to create the backbone that will enable best-in-class connectivity solutions for years to come," said Hakim Boubazine, Co-President and Chief Operating Officer, Altice USA. "Altice USA is a major powerhouse, delivering broadband, pay television, telephony services, Wi-Fi hotspot access, proprietary content and advertising services to residential and business customers. They are innovative and agile and focused on delivering on the promise of full convergence in this hyper-competitive market. We are delighted to partner with Altice in the U.S. on this industry-leading solution," said Eric Updyke, group president, Amdocs Services. Amdocs introduced a Mobile Financial Services card management system for helping service providers in launching their own debit or prepaid payment cards. The cards can be linked to a mobile wallet, with stored monetary value, loyalty points or airtime as the source of funds. Amdocs said its card management system can be quickly deployed on the cloud as Software as a Service (SaaS), integrating securely with local card-manufacturing companies for card printing and distribution. The system incorporates a back-office administration user interface that manages card specifications, card product definitions and issuer identification number (IIN) ranges. The company also noted that customers who don’t have a bank account can use these cards to pay for purchases at retail point of sale terminals, to withdraw cash from an ATM or for online shopping. Vindicia: offers software-as-a-service (SaaS) subscription management and payment solutions. Vindicia helps digital enterprises to onboard customers and process payments for digital content, over-the-top (OTT) entertainment, online subscriptions and on-demand services. Brite:Bill: focused on transforming the customer bill into a unique, customer-centric engagement channel. Brite:Bill's technology and services transform invoices into a personalized, digital, interactive billing experience in the channel of the customer's choice. The invoice's customized and engaging design reduces customer confusion around the bill, thereby cutting service provider costs around inbound inquiries, and also provides an engagement opportunity for service providers to promote new services. Pontis: provides contextual digital engagement solutions. Pontis's real-time decisioning and learning technology enables service providers to offer their customers personalized contextual interactions relevant to where that individual customer is in their journey with the service provider. Pontis helps service providers determine the next best action for customer engagement and then to offer the customer, across outbound and inbound channels, the most appropriate service at the right time and the right touch point. "Communication and media service providers, including those with over-the-top offerings, are transforming to capture the world of on-demand services and digital immediacy. When combined with business-driven analytics behind the scenes, this ensures a simplified, intuitive and engaging customer experience," said Eli Gelman, Amdocs Management Limited president and CEO. "These acquisitions, alongside Amdocs' existing platforms which include multi-channel, digital care and commerce, customer management and big data analytics solutions, position Amdocs as the market leader to help communication and media providers on their journey. I am excited by these companies joining Amdocs, as their cloud-based technologies will augment Amdocs' rich offering and shorten our time to market," Gelman continued. The three similarly priced companies were acquired for a combined amount of approximately $260 million in cash, net, and may be subject to certain adjustments including small earnouts. Amdocs will serve as integrator for telecom companies and cloud developers who want to use AT&T’s ECOMP platform to build their own software-centric network services. ECOMP is the service orchestration system that powers the AT&T software-defined network (SDN). Earlier this month, AT&T confirmed that it is committed to releasing ECOMP into open source. Amdocs said it will help companies deploy that open source software into their own networks. ECOMP is a vital tool for service providers struggling to meet today’s network demands while preparing for an even greater load in the next few years from applications like virtual reality and augmented reality, 4K video and the Internet of Things. 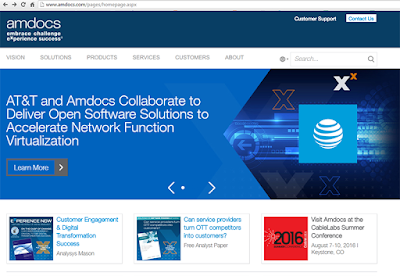 AT&T confirmed that it is committed to releasing into open source its current Enhanced Control, Orchestration, Management and Policy (ECOMP) platform, which is the service orchestration system that powers the AT&T software-defined network (SDN). AT&T said ECOMP is mature, feature-complete, and tested in real-world NFV deployments. The company believes open source ECOMP will bring maturity to SDN and become the industry standard for orchestration, management and policy control. By releasing the ECOMP code as open source, AT&T said other service providers will be able to use this software to meet non-stop network demands as data-hungry technologies like autonomous cars, augmented and virtual reality, 4K video and the Internet of Things (IoT) take off. VoLTE call drops can be four to five times higher than calls on 2G or 3G networks, according to newly published research from Amdocs that analyzed more than 25 million voice and data connections from 80 different network operators around the world in the past 12 months. "The Amdocs State of the RAN research reinforces the sheer strain mobile networks are under,” said Ann Hatchell, head of network marketing at Amdocs. VoLTE call drops can be four to five times higher than calls on 2G or 3G networks: VoLTE is an important and strategic service for operators as it offers operating expense (OPEX) and capital expense (CAPEX) reductions through the promise of repurposing 2G and 3G services. However, this study suggests that the quality of experience VoLTE provides initially, post-deployment, can be less stable than the traditional voice service it replaces, requiring aggressive tuning by the operator. Network data demand is increasing every year: Research suggests that the volume of mobile data usage is growing across the world at approximately 60 percent year-on-year, particularly with increased demand for video on devices providing better entertainment opportunities to mobile users. However, with only 5 to 15 per cent of Wi-Fi traffic going through mobile devices that is able to be accurately described as Wi-Fi offload, the study highlights that service providers need to offload more traffic from cellular networks to Wi-Fi networks, in order to realize greater cost and operational efficiencies. Seventy-five percent of network traffic in cities is in-building: In times of network congestion, indoor users face up to a 25 percent increase in network issues compared to outdoors users. By understanding and visualizing the real-world patterns of demand, coverage and congestion, operators could effectively target network optimization efforts at these problem areas to deliver a consistent, quality of network experience. Music and sport events create their own mobile ecosystems: SMS is still the killer app with an average of 70 percent of attendees at a concert or sporting event sending at least one text message during it, which causes spikes in network usage. Therefore, there is a need to manage network capacity during an event, with network cells around an event’s location carrying approximately 50 percent more traffic than the cells inside a stadium for example. This indicates there is considerable communication with fellow event attendees while going to the venue through email, text and social media. Meanwhile, it was also seen that international roamers upload almost 50 percent more data while at events than non-roamers. International roamers suffer poorer network experience: Despite the fact that international roamers can offer operators greater revenues than a corresponding locally-based subscriber, their network experience can be up to 25 percent worse. There is an opportunity for operators to realize greater monetization of services by isolating profitable international roamers, understanding their distinct usage patterns, and optimizing the network to better target them. Amdocs agreed to acquire a substantial majority of Comverse's business support systems (BSS) business unit assets for approximately $272 million in cash. Amdocs said it will maintain and support Comverse customers around the world. The acquisition geographically complements Amdocs' market focus by expanding and diversifying Amdocs' global customer base, particularly in Asia Pacific, Latin America and Europe, and including Europe's cable and satellite market. "Amdocs is a leader in customer experience solutions for the communications industry. With Amdocs' broad range of products and services, this agreement will only serve to benefit existing Comverse BSS customers," said Philippe Tartavull, president and chief executive officer, Comverse. "Customers should feel assured by Amdocs' experience with smoothly integrating acquisitions and their commitment to maintaining and growing relationships." Comverse will continue to exist as a separate company, with a singular focus on expanding its global market leadership in digital services. At this week's Mobile World Congress, Juniper Networks and Amdocs will showcase an automated virtualized customer premises equipment (vCPE) solution that leverages Juniper's vMX router and vSRX firewall.The joint offering also utilizes Juniper's Contrail Networking framework. The Amdocs Network Cloud Service Orchestrator allows provisioning and rapid fulfillment of both virtual and physical network functions services. As part of the joint offering, Juniper and Amdocs are also providing a user portal for self-service selection, a service catalog and service creation capability, and a wide range of delivery and managed services options to help service providers transition to an IT cloud operating model. Amdocs introduced its Network Cloud Service Orchestrator, an open, vendor-agnostic, catalog-driven solution for defining and activating complex services containing virtual network functions (VNFs) from multiple vendors. The idea is to converge service fulfillment and assurance into a holistic, real-time process. Amdocs said its solution enables the continuous design, fulfillment and assurance of network services, from any VNF vendor, utilizing existing service catalog and ordering systems, over all mainstream cloud management systems and SDN Controllers in a hybrid physical and virtual environment. "More than 250 service providers run Amdocs' mission-critical solutions. Of those, over 100 already benefit from Amdocs' network-grade, control-plane solutions, with distributed processing of more than 1 billion low latency events per day in some of our larger deployments. This heritage of service management and orchestration gives Amdocs a unique understanding of the communications market and makes us an ideal partner for service providers seeking to realize the benefit of NFV and cloud-based services," said Rebecca Prudhomme, vice president of product and solutions marketing. Amdocs is also announcing an NFV Service Partner Program focused on pre-integrating a rich set of VNFs and NFV infrastructure elements in order to simplify the complexity of service orchestration, improve service time-to-market, and address end-to-end Service Level Agreement considerations. The program currently has 21 partners including Juniper Networks, Metaswitch Networks, Red Hat and Connectem. Amdocs introduced a virtualized policy control and charging rule function (PCRF) solution specifically designed to support the stringent feature requirements that enable a high definition (HD) quality and differentiated VoLTE experience. The Amdocs VoLTE Controller can operate in a dedicated hardware environment or as a virtualized appliance. Amdocs says its solution comes with pre-packaged services for rapid deployment in two months. It operates as a dedicated PCRF solution for VoLTE and can be deployed alongside legacy PCRF systems, which can continue to support basic policy needs such as fair usage control. Amdocs noted that its solution is already supporting VoLTE services at a Tier-1 North American operator. The company has also been selected for policy control support of VoLTE by a European Tier-1 service provider. "Landline services have set the bar for voice and service providers are challenged to meet and exceed those expectations with VoLTE," said Rebecca Prudhomme, vice president of product and solutions marketing at Amdocs. "This solution extends policy control for VoLTE with its extensive support for emergency call services, voice roaming and other critical voice service attributes; having a specialized PCRF solution, designed with the rigors of VoLTE in mind, is vital for operators seeking to differentiate next-generation voice services over LTE." Amdocs introduced its Self-Optimizing Networks (SON) solution for automated optimization of radio access networks (RANs). Amdocs SON, which is currently being deployed by TIM Brasil and three other operators in Latin America, is designed to help service provider deliver better network performance, data traffic improvements, improved capacity and near-real-time performance, especially during major sporting and cultural events. Vendor-agnostic, with multi-technology support - delivers maximum impact regardless of network equipment provider or technology. Customer experience/value-driven - integrates market-leading business support systems (BSS) with SON to target optimization more effectively by subscriber location and value. The company claims its optimization results in 10% faster mobile broadband, 10% increase in utilization and 20% fewer dropped calls. Amdocs provides integration services to tie its SON into existing equipment, operational/business support systems and processes. "Amdocs SON, the flagship offering of our new Amdocs Network Solutions business, reflects our expanded focus on the network software domain," said Rebecca Prudhomme, vice president of product and solutions marketing at Amdocs. 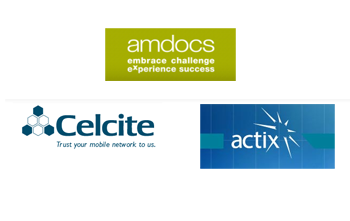 Amdocs agreed to acquire Celcite Management Solutions LLC, for approximately $129 million in cash. Celcite specializes in self-organizing / self optimizing network (SON) and network management solutions. The company, offers a centralized, intelligent OSS system that leverages capabilities such as geo-location and intelligent automatic correlation systems to deliver network automation. The company was founded in 2003 and is based in Herndon, Virginia. 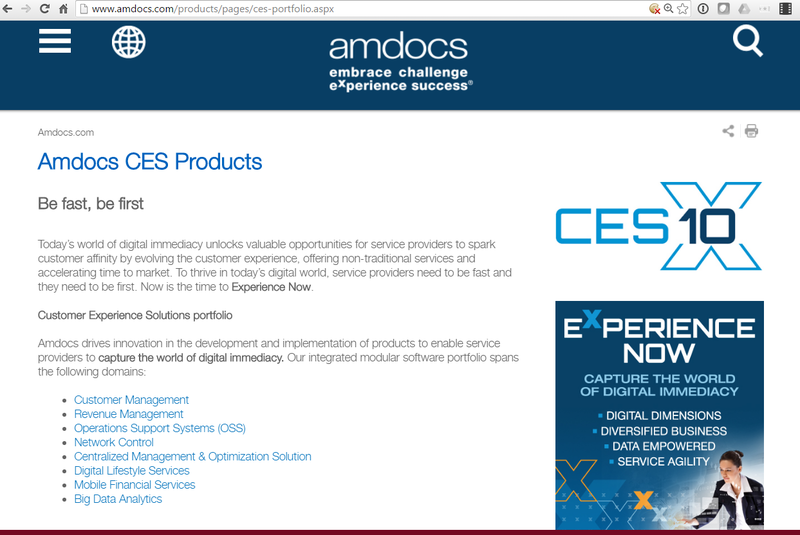 Amdocs said the acquisition expands it customer experience portfolio further into network software. The deal builds upon and enhances Amdocs' recent acquisition of Actix. The goal is to provide communication service providers with a wide range of product-led services to better optimize their hybrid mobile networks, including solutions that can accelerate the rollout of existing networks and new network deployments such as LTE, WiFi and small cells. These solutions will be agnostic to manufacturers of network equipment and components. In addition, Amdocs will be expanding its CES (Customer Experience Systems) portfolio with QOS-focused, geo-located network data that will drive a variety of optimization use cases. Amdocs believes it will be the first supplier to offer customer experience-driven network optimization software and services based on a holistic view of the customer experience across all domains. "Together, Amdocs, Celcite and Actix will emerge as the preferred provider of network management and SON solutions to service providers worldwide," said Rahul Sharma, founder and chief executive officer at Celcite. "With the combination of our people, assets, and product/services expertise, we will offer unmatched end-to-end offerings to relieve customers' core network challenges, including capacity and rollout, and help them tie the customer experience to the network in real-time." "Amdocs customers must optimize their networks to handle the data explosion and reduce associated costs," said Rebecca Prudhomme, vice president of product and solutions marketing at Amdocs. "One of their largest pain-points is dealing with issues that arise within the radio network, which are typically responsible for a large percentage of all customer satisfaction and churn problems. The acquisition will enable Amdocs to better offer our customers solutions (both products and services) for the management and Radio Access Network (RAN) optimization of all mobile networks including 2G, 3G, LTE and small cells to maximize the return from their network assets." Amdocs and Vodafone have signed a five-year global managed services agreement for Vodafone's customer care and billing domain based on Amdocs software applications. Specifically, Vodafone selected Amdocs to be the managed services provider to deliver application development, operations and maintenance services. Amdocs will establish a dedicated Shared Service and Development Center for Vodafone and this center will start with servicing Vodafone's local markets in Germany, UK and the Netherlands. Financial terms were not disclosed. "This agreement is testament to the relationship between Amdocs and Vodafone that stretches over two decades," said Rebecca Prudhomme, vice president of product and solutions marketing at Amdocs. "Our managed services model helps Vodafone to provide a consistent customer experience across markets through standardized service-level agreements, as well as leverage Amdocs' business knowledge and expertise to deliver service excellence and innovation."